Diddy was there with a whole “gang” of rappers that included T.I., Trinidad James, Wale, Jermaine Dupri, Lil Scrappy and Rick Ross. Bieber’s newest “squeeze” Chantel Jeffries was also in attendance and the Canadian pop star had taken off his shirt, all the better to see his ink and chains. Photos of the rappers in the Vanquish nightclub show a lot of smoke and a hookah pipe. 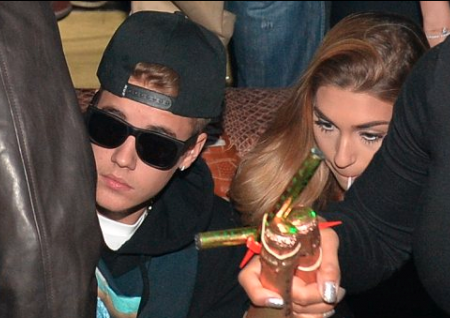 Justin might just as well get all his partying in now. On top of the charges the singer faces in Miami, Florida for DUI, driving with an expired license and resisting arrest; the teen star is also facing charges in Toronto, Canada for assaulting a limo driver. It now looks like Californian authorities have come to the decision to charge the Canadian singer for felony vandalism after his alleged egg attack on a neighbor’s house that caused over $20,000 worth of damage. Police, who searched Bieber’s Californian home, found drugs – in the form of Ecstasy and Xanax – and apparently they also found something that ties the misbehaving star into the egg throwing incident. It could be that footage from the Baby singer’s own security cameras have provided the proof needed for a conviction. It has been reported that the Los Angeles District Attorney could go for the felony prosecution which would have heftier consequences than if Bieber had been charged with a misdemeanor. The Los Angeles County Sheriff’s department have concluded their investigation of the charges against the performer and are pushing for the D. A. to prosecute Bieber to the maximum extent of the law. In the mean time, Justin Bieber is eating, drinking and making merry while waiting to see if any of the charges laid against him will result in jail time. The Believe singer has been on a downward spiral for some time now and his rumored mistreatment of his former girlfriend Selena Gomez does not put the entertainer in a good light. The L. A. District Attorney will not be making a decision about prosecuting Bieber on a felony charge until at least next week according to the Los Angeles County D. A. spokesman Ricardo Santiago. It was Santiago who explained to CNN that the final decision would be made by the District Attorney. Justin has three prior cases dropped by prosecutors and this Californian version of wrist slapping for the performers misbehavior could count against the teen star. Despite Justin Bieber having several different charges hanging over his head from two separate countries he doesn’t seem too concerned. At the Atlanta nightclub where he was seen eating, drinking and being very merry Bieber obviously is not expecting wind up in jail. If the D. A. does go for the felony charge, Justin will have to turn up personally for the charges to be made in court. With at least five different charges facing the performer, Bieber should probably enjoy himself while he still has the freedom to do so. 3 Responses to "Justin Bieber Eat Drink and Be Merry While Waiting for Jail?"